(Read about 2009 here and read about 2015 here), and while all three shows were very similar, last night’s edition did provide a fair amount of surprises and songs that have not been played live in decades. For example, the show began with ‘A Hard Day’s Night’, a song that, until this current tour of Paul’s, was not performed by a Beatle since 1965! Also ‘Love Me Do’ has been performed on this tour, marking the first time Paul sang it in concert since October 1963, a full three months before the mop-tops arrived in America. (Ringo performed the song on his 2000 tour). Those set list additions were wonderful, but, for me there was even a more surprising addition of a song that I would have never dared dream would ever be performed: The Quarrymen’s ‘In Spite of All the Danger’, written by McCartney and George Harrison and recorded in 1958! That song has been a personal favorite of mine since it was included on the first Anthology set in 1995, and being part of the audience who sang the background harmony vocal (at Paul’s urging) was a wonderful concert moment. 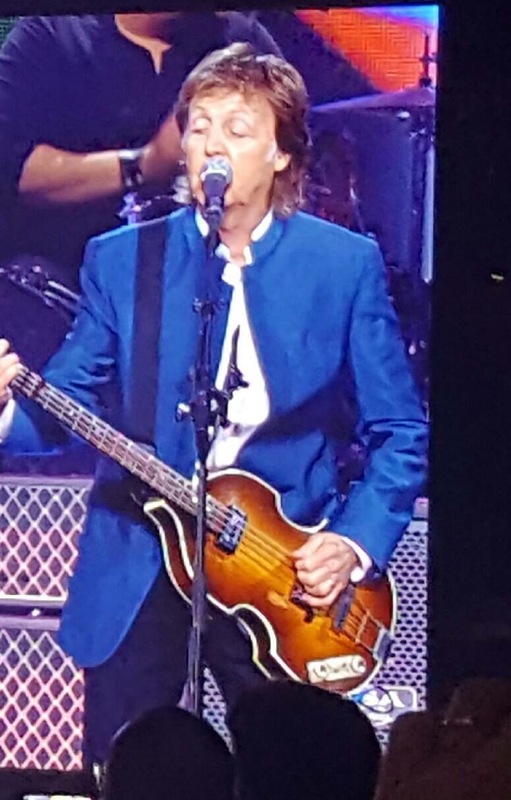 Paul is still a great performer, and very energetic. However, his voice is getting very thin (I still can’t believe that he sings everything in the original key, not tuning down at all). There were some moments where he struggled to reach for a note, but those moments didn’t mar a fantastic performance. Every time I read over a McCartney set list (since he began playing Beatles tunes live again in 1990, anyway) I always marvel at how many songs that are included are not just great songs, but landmarks in the pantheon of pop music. It boggles the mind if you think about how many seminal songs Paul had a hand in writing. Because of that, there are about ten songs that, every night are ‘required’ inclusions in the set. People want to hear ‘Hey Jude’ and ‘Let it Be’…and ‘Yesterday’ and ‘Live and Let Die’; if you see a Paul show, you will hear those songs, and they are great concert moments. As great as those moments are, I wouldn’t mind if Paul skipped ‘Hey Jude’ or ‘Live and Let Die.’ I know that won’t happen, and that’s okay. This was the first time that Dana and I had seen Paul where we had seats beside one another, so I got to watch her watch the show, which was great. She told me she would cry, and she did. I think it started one verse into the opening number. Now, as a rule I am not a crier at shows; goosebumps? Sure, many times at many shows; but actual tears? That’s rarely, if ever happened. Until this show…and it happened to me not once, but twice! Ever since the wonderful 2002 tribute ‘Concert for George’, Paul has played ‘Something’ and dedicated it to his friend. He begins the song solo on the ukulele for a verse and a chorus, and then when the song arrives at the middle guitar solo, the band joins in to finish the number very close to how it sounds on “Abbey Road.” Right at that moment when the drums and guitar enter, the projection screen behind the band showed a huge picture of George, circa 1970, then they showed pictures of Paul and George in the studio, around a vocal mic smiling and laughing. That’s when I began to cry. After ‘Something’ came ‘Ob-La-Di, Ob-La-Da’ which ended In an uproarious sing along. I managed to get myself together by the end of that song. But then, the next song was ‘Band on the Run’ and, as they have done for the past few tours, during this number, the screen displays an archival film of the Band on the Run album photo shoot, showing Paul, Linda, Denny Laine and ‘friends’ posing as prisoners caught in the search light circa 1973. During the first chorus, the screen showed a close up of Linda and I ‘lost it’ again, this time unashamedly using the collar of my shirt to wipe my face. While I saw the exact same images at the show in Charlottesville last year, for some reason, seeing them this time hit me very hard emotionally. It marked the first time I shed tears since hearing of Bowie’s death in January. (2016 has been a helluva year, hasn’t it?) I know I wasn’t the only one crying and smiling through tears, it just really surprised me at the emotional punch those moments had. When Paul released the compilation “Wingspan: Hits & History” in 2001, he practically apologized for including the song ‘Hi, Hi, Hi’ and it’s obvious reference to marijuana. Thankfully, the song has been added back to the set and it’s a highlight, no apologies necessary. As I watched the show, I couldn’t help but feel that this may be Paul’s last go-round. Now, the very next day, Rolling Stone published an interview (Read it here) where Paul talks about a new album and doesn’t even hint that he’s stopping any time soon. I hope he tours for years to come, but if this is indeed his last global trek, I’m very glad he’s still in top form, and appears to be having such a great time. Extra special thanks to the staff at Verizon Center, especially Larry, who made sure we were taken care of and arrived at our seats safely without having to negotiate a fair amount of stairs. It was a pleasure seeing this show with Dana. I sincerely hope it wasn’t our last Paul show. Great review! Brought back my tears from the show. Thanks!